Some commercial salts are specially designed for marine invertebrates. From the start, i.e. when you put the first water in, use commercial salts enriched in calcium. Then, add the same salts over the course of regular partial water changes, at the rate of 10% per week. Use commercial products specially prepared to increase calcium levels. Place a calcareous element, such as calcareous rock, or crushed and washed oyster shells, in the filter, and this will gradually release calcium. However, this method will not give rise to any rapid or significant increase in calcium levels. 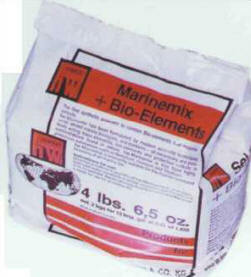 Prepare a solution of slaked lime, Ca (OH)2, available in aquarium stores, at a rate of 1.5 g/liter. Pour in 1 ml of this solution per liter of sea water. 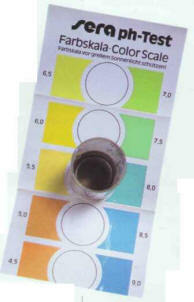 Proceed gradually, monitoring the pH constantly to ensure it does not rise above 8.5. This is the most complicated, but also the most effective. the other of sodium bicarbonate (NaHCO3), at a rate of 17 g/liter, which will provide the carbonates. Then calculate the difference between a carbonate hardness of 130 ppm (7.2°CH) and the one measured in the aquarium. Multiply the result by the net volume of the tank, and divide the result by 10. This will give the amount of each solution required, in milliliters, to pour into the aquarium. Amount of each solution (in ml) = 500 x (130-100) + 10 = 1,500 ml. The following table gives you the required amount of each solution (in ml) for specific cases. By filtering the water, the Coelenterates trap small suspended particles, particularly the crustacean zooplankton. Collecting, keeping, and distributing plankton is not a task to be taken lightly, and it is best to look for other solutions. In their natural habitat, Coelenterates feed on animal plankton, but these are difficult to supply in an aquarium. However, it must be made clear that commercial foods on the market provide little more than a stopgap. 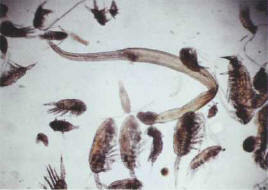 It is possible to use rotifers or freshly hatched brine shrimp nauplii, normally used as the main food for fish, but not everybody breeds these animals. There is another food which is available to all hobbyists, as it is inexpensive, easy to make, and can be frozen: it is usually called mussel choppy. Mussels are not only cheap but also rich in proteins, carbohydrates, mineral salts, and vitamins. Other possibilities are cockles, the flesh of lean fish, or cans of shelled shrimps, which are produced in large quantities in Asia, cost little, and are readily available. The Coelenterates can cohabit with algae - encrusting or otherwise - and even with small fish. The other problem is establishing a feeding schedule. It must be remembered that the majority of organisms being fed play host to Zooxanthellae, which often satisfy a significant proportion of their dietary needs, and so a weekly feed is more than sufficient. Do not forget that the best time for this is the night before a water change, to reduce the risk of pollution. 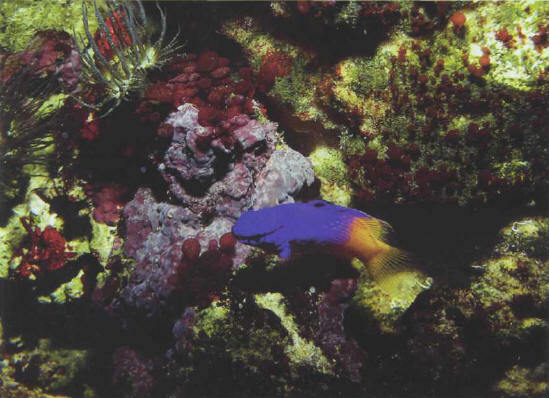 The larger anemones feed on adult brine shrimps, small pieces of mussel, fish, or shrimps or a mixture of these. shelled shrimps in cans (optional). Cook the mollusks and fish. Put the shrimps in boiling water for 1-2 minutes. Remove the mollusks' shells. Mix all the ingredients thoroughly. You can add a vitamin solution, flakes or granules of fish food, boiled spinach, or the special foods for invertebrates available commercially. If the paste is too thick after mixing, thin it with sea water. Pass the mixture through a sieve. What is left behind in the sieve can be distributed to anemones or small fish; this puree can also be frozen. Allow the puree to stand for several hours in the refrigerator, then discard any excess water. The resulting paste can be used straightaway for feeding, or can be frozen. It is best to put the food into the aquarium at night, 1 or 2 hours before switching off the lights. Switch off the filters, pumps, and aeration for a moment. Thaw the food, if necessary, and distribute the equivalent of one tablespoon of the prepared liquid for every 200 liters of water. Deposit the food above the invertebrates with a narrow, rigid tube. The filtration and aeration systems can be switched back on a few minutes afterwards. Urticant (stinging) Coelenterates must be kept apart from the more delicate species: a safety margin of 10-15 cm is often recommended. The madreporites and anemones are among the most urticant, and they must not be put alongside a leather coral from the Sarcophyton genus, for example. Other alternatives for a Coelenterates tank are algae - whether encrusting or not - supported by live rocks, or even caulerpae. Their development must be controlled so that they do not end up smothering the Anthozoa. The introduction of certain fish is possible, even desirable, but there are cases of classic incompatibilities (see table, page 178). Specially designed artificial decor can be colonized quickly, depending on the organisms' rate of growth and reproduction. This can sometimes make it difficult for even a practiced eye to spot the difference between artificial and natural decor in an aquarium which has been in operation for several months.